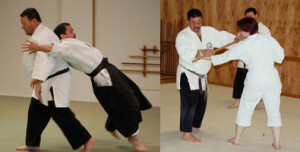 Howard Popkin Sensei and Joe Brogna Sensei, the Head Instructors of the Daito Ryu Ginjukai will conduct this annual intensive designed to expose students to their newly developed curriculum. Attendance is open to any students regardless of previous experience or affiliation. It is best of those doing partial attendance try to come at the beginning if possible. The “aiki” principles at work in the Daito Ryu can readily be applied to ones Aikido, whatever form one prefers.